Britain - Durotriges. Gold stater, ca. 60-20 BC. Obv. Stylized Apollo head. Rev. Disjointed horse, rosette below. Spink 26; M. 47; V. 1458; BMC 137-44. Gold. 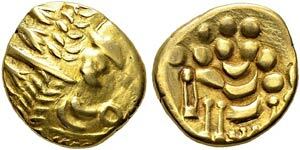 5.98 g.
Rare variant struck in yellow gold, with rosette below horse.